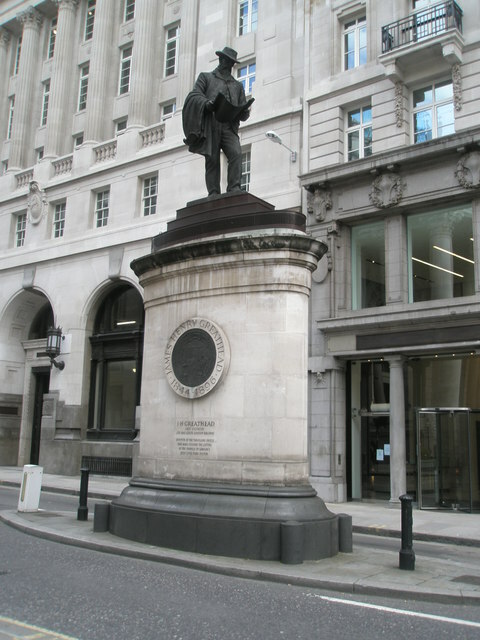 Erected way back in the midsts of time, in 1994, outside Bank Underground station is a statue to James Henry Greathead, an engineer born in South Africa in 1844 who went on to become instrumental in the tunneling processes which led to the modern tube network. Greathead was notable for his work on the tunneling of the Tower Subway - only the second tunnel under the Thames after the one created by the Brunels - and also his time as resident engineer on the Hammersmith extension railway and the Metropolitan District Railway, as well as the Waterloo and City Line, and a section of the City & South London Railway which is now part of the Northern Line. The statue which stands to him today is fittingly built on a London Underground ventilation shaft. I saw this statue recently and crossed the road to get a better look at the plaque as i had no idea who he was. There must be so many statues in London of people now have forgotten but who deserved to be remembered for their good deeds and contribution to the city etc. This is my great Great Grandad - makes me very proud to see it! Lovely to hear that. It's good London has such a great history of remembering people.